The Hawaii Physical Activity & Nutrition (PAN) Newsletter is a quarterly electronic newsletter created to help increase awareness of PAN programs, projects, and initiatives in our state and nationally. The newsletter helps to provide a method of communication and resource sharing for Hawaii physical activity and nutrition professionals and others interested in these issues. The newsletter is distributed to over 1,000 PAN professionals worldwide. Includes: Worksite Wellness at UHA Health Insurance, New Hawaii Food Access Coordinator, Hilo Bayfront Trails Wayfinding Sign Project, Wailuku Wayfinding Project, and much more! Includes: KOKUA Balance Bike Rodeo, Get Fit Kauai, ‘AINA In Schools, and Workplace Wellness. Includes: Mayor-a-Thon 2017, Workplace Wellness at HH@WA, Kauai Safe Routes to School & Worksite Wellness, Choose Healthy Now Makes Statewide Impact, UHA’s Workplace Wellness Model, and much more. Includes: Welcoming Biki to Honolulu County, Choose Healthy Now in Each County, HH@WA’s Hawaii-Centric Worksite Wellness Survey, Combatting Rat Lungworm Disease, Hilo DOH Blue Zones Project, Kauai Master Gardeners, Maui Earth Day Event, and much more. Includes: Honolulu Health & Physical Education Wellness News, Hawaii’s Baby-Friendly Hawaii Project Impacts Breastfeeding Rates, Kauai Safe Routes to School and Worksite Wellness Challenge, and much more. Includes: Hawaii Farm-to-School, Kū ‘Āina Pā Learning Garden, Preserving Our Islands’ Agricultural Products, Waimānalo Market Co-op: Working to Enhance Community with Local Food, ʻĀINA In Schools: PA and Nutrition Opportunities, and much more. Includes: Hawaii After School Alliance Summit, American Cancer Society Workplace Solutions, Bikeshare Hawaii, School Fitness Meets in Honolulu Hawaii PAN Plan Highlights, and much more. Includes: Hawaii PAN Forum & State Plan, GF Kauai Wins National Award, Hawaii County Community Gardens, World Wide Voyage & ‘Ai Pono, Wellness Improves in DOE Schools, Maui School Gardens, UHA Receives AHA Award, Employers Taking “A STAND”, and much more. Includes: Keiki Great Aloha Run, Access to Healthy Foods with EBT, Commit to be Fit at Ka‘a‘awa Elementary, Local Physical Activity Professional Trainings, Kauai SRTS and Worksite Wellness, Hawaii Farm to School, CHN at Castle Medical Center, and much more. Includes: Rethink Your Drink Teen Video Contest, Waimanalo Aquaponic Project, Tour de Cure on Oahu, North Shore Food Summit, Fitnessgram 10 in Honolulu Schools, SEEQS Charter School PA and Food System, SNAP-EBT Farmers Market Cooking Demos, and much more. Includes: Choose Healthy Now Kick-off, Eat Your Veggies at School, World Breastfeeding Week Celebrations, HMHB Breastfeeding for Business, Hawaii Food Day Events, Kauai Awarded $1.1M for SRTS, Kaiser Hospital’s Farmers Market, Fitness Meets with Local Schools, and much more. 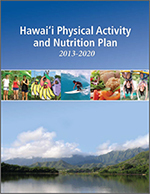 Includes: 2013-2020 Hawaii PAN Plan Implementation, WIC Boosts Money for Fruits & Vegetables, Bikeshare Hawaii, Hawaii Island School Garden Network, HMHB Local Health & Nutrition, Let‘s Move Hawai‘i, Health & the Built Environment, and much more. Includes: Healthy Keiki Fun Run, Bikeshare in the News, SNAP-Ed Cooking Demos, Baby Behavior Training at Hawaii WIC, Salt Reduction in Filipino Foods, Waimanalo Community Gardens, Tracking Hawaii Public Health Data, and much more.